Any budget conscious home cooks will love to cook this hearty soup, Bacon, Corn and Potato Chowder. It costs very little to make and it is very filling too. You be surprised to know it uses no chicken broth or cream, so it is easy on the waistline and pocket too. This is my second Curtis Stone's recipe, and I am convinced this hottie chef can creates great food as well. What's For Dinner?. In the book version, low sodium chicken stock and part whipping cream are used for liquid. But I think the Coles's recipe works just as great too. In a large heavy-based saucepan, cook the bacon over medium heat for about 2 minutes. Add the butter and cook for 1-2 minutes until melted and just golden. Add the onion and garlic and cook for about 4 minutes until the onion is soft. Add the celery, thyme and cayenne pepper and cook for 4 minutes, being careful not to colour the vegetables. Add the flour and stirring constantly, cook for about 2-3 minutes. Stir in the water and potato. Cook for 8 minutes or until the potato is tender. Add the milk and corn to the pan and increase the heat to medium high. Bring to simmer, stirring constantly. Hi Lena, my daughter is 16 years old and is still the baby of the family. The older two are boys:D. Having quite grown up kids can be a headache too.They are just as picky and no longer want to eat sweet stuff like cakes. Hi Lian, you are right. All the ingredients are easily accessible. Sounds really easy to make too. I like lots of Curtis's $10 meal recipes but I alway feel that the ingredients he used can't be that cheap! I laughed knowing that you are convinced that the hottie chef can cook ... I'm convinced too... Great soup! Woohoo, this looks nice, and easy to put together! Hi Lian, I think this chowder looks very delicious and so simple to cook! 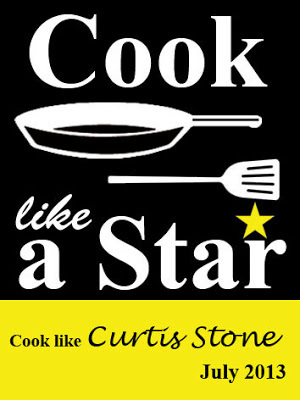 I should try to cook more of Curtis Stone's recipes too!